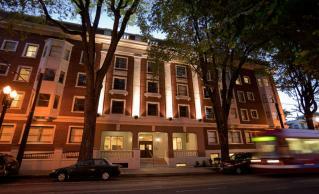 Home Forward completed a sustainable-design renovation of downtown Portland’s historic Martha Washington Hotel in June 2010. Originally built in 1923, this former boarding house is now home to more than a hundred low-income households living in a mix of studios and one-bedroom apartments. The property was conveyed from Multnomah County to Home Forward for development in 2009. Central City Concern provides property management and social services for residents. 108 units provide a mix of studio and 1-bedroom apartments serving households below 60% MFI. Operational subsidies include 45 project-based Section 8 units and 25 public housing units. Of these units, 50 operate as Permanent Supportive Housing (PSH) serving homeless and chronically mentally ill populations. Sustainability: high efficiency central water-heating system, unit heaters that switch off when windows are opened, a high efficiency ventilation system with heat recovery capabilities, and lighting with occupancy controls will yield LEED Silver certification; to comply with historic preservation guidelines, the building’s exterior appearance and interior features such as the long corridors and intricate details of doors, windows, ceilings, trim, and railings were maintained. A Rich History: Opened as the Campbell Court Hotel and later served as the Martha Washington Hotel operated as a boarding house for many years. During a brief period in the mid-80’s, the building was owned by Rajneesh Investment Corporation and known as Hotel Rajneesh.